One day it will just happen. You’ll be all excited to go to your local Jimmy John’s during your lunch break at work. Strutting over in your favorite outfit, you’ll open the door to the sandwich joint, walk up to order, and then see it: A warning that eating sprouts can make you sick. No, this is not a drill. Yes, it’s real, and YES, it’s disappointing. But unfortunately, it’s the truth; eating sprouts can make you ill.
And no, not just kind of sick, but sick-sick — as in sick with salmonella or E coli. According to foodsafety.gov, sprouts are the perfect food… for bacteria to live in. The site says "a sprouting seed offers as inviting and nourishing an environment as bacteria like Salmonella or E coli could want--and the warm, moist conditions in which sprouts are produced only make matters worse. A single Salmonella organism on the outside of a seed can easily grow to an infectious dose after it has sprouted." Sadly, getting sick from sprouts has occurred every year since at least 1995. That’s because it’s difficult to actually grow safe sprouts. Even though the U.S. Food and Drug Administration has developed guidelines to make sure sprout-growers reduce the risk of contamination, it’s not fool-proof. 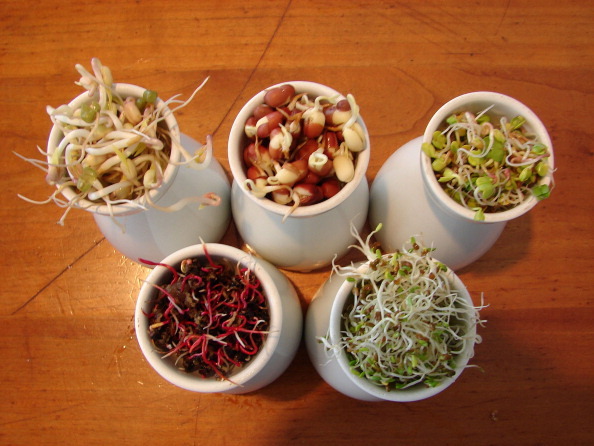 "The bacteria in or on growing sprouts cannot be washed off. Because even a low dose of Shiga toxin-producing E coli can make you sick, sprouts are a powerful vehicle for transmitting illness." But if you do choose to indulge in a little sprouted goodness? Just remember you’re eating them at your own discretion and risk.